a nonessential amino acid that occurs in proteins and is involved in the urea cycle and in the synthesis of creatine. Preparations of the base or the glutamate or hydrochloride salt are used in the treatment of hyperammonemia and in the assessment of pituitary function. An amino acid occurring among the hydrolysis products of proteins, particularly abundant in the basic proteins such as histones and protamines. A dibasic amino acid. /ar·gi·nine/ (Arg) (R) (ahr´jĭ-nēn) a nonessential amino acid occurring in proteins and involved in the urea cycle, which converts ammonia to urea, and in the synthesis of creatine. Preparations of the base or the glutamate or hydrochloride salt are used in the treatment of hyperammonemia and as a diagnostic aid in the assessment of pituitary function. An amino acid, C6H14N4O2, obtained from the hydrolysis or digestion of plant and animal protein. an amino acid formed during the urea cycle by the transfer of a nitrogen atom from aspartate to citrulline. It can also be prepared synthetically. Certain compounds made from arginine, especially arginine glutamate and arginine hydrochloride, are used intravenously in the management of conditions in which there is an excess of ammonia in the blood caused by liver dysfunction. See also urea cycle. A facultatively essential amino acid that contains a guanido group with a pKa > 12, which carries a positive charge at physiological pH; it becomes an essential amino acid when the body is under stress or injured. Food—turkey, chicken and other meats. An amino acid believed to decrease cancer risk, and given as a nutritional supplement; arginine stimulates sperm motility. Biochemistry A 'facultatively' essential amino acid that contains a guanido group with a pKa > 12, which carries a positive charge at physiological pH; it becomes an essential amino acid when the body is under stress or injured Sources Turkey, chicken and other meats. See Unproven methods for cancer management. One of the amino acids occurring among the hydrolysis products of proteins, particularly abundant in the basic proteins such as histones and protamines. A dibasic amino acid. Fig. 46 Arginine . Molecular structure. one of 20 AMINO ACIDS common in proteins. It has an extra basic group, and is alkaline in solution. The ISOELECTRIC POINT of arginine is 10.8. See Fig. 46 . 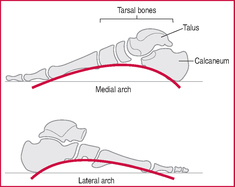 The longitudinal arches of the foot. an amino acid, one of the 20 building blocks of proteins in food and in the body. Not normally one of the 'essential' amino acids in the adult diet as it can be made in the body from other substances, but usually considered essential for children, as deficiency impairs growth; also in adult males deficiency has been linked to a low sperm count which dietary supplements can improve. One of the substances used by some athletes with the intention of stimulating growth hormone release, and so promoting gain in muscle mass and strength, but this action, at least by arginine taken alone, is disputed; there is better evidence for its effectiveness when combined with other amino acids. See also ergogenic aids; appendix 4.4 .
n an essential amino acid that has been used as an adjunct therapy in congestive heart failure, erectile dysfunction, peripheral vascular disease (PVD), and angina pectoris. It may also be useful in the treatment of upper respiratory ailments, type II diabetes, and various hematologic conditions. Precaution advised for those with gastritis, peptic ulcers, and acid reflux disease as well as for those taking NSAIDs, antiplatelet medications, theophyl-line medications, corticosteroids, postassium-sparing diuretics, or ACE inhibitors. 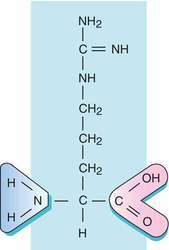 An amino acid occurring among the hydrolysis products of proteins, particularly abundant in the basic proteins. n an essential amino acid for infants and children. See also amino acid. a basic amino acid occurring in proteins and essential for many species, particularly the cat. see arginine dihydrolase test (below). a test for the identification of bacteria, based on the conversion of l-arginine to putrescine. In a positive result, the alkaline product is indicated by bromocresol purple. Called also arginine deaminase test. an androgen-dependent enzyme derived from the prostate which occurs in high concentrations in seminal plasma. results in elevated blood ammonia concentration. Cats are particularly sensitive and within hours of eating an arginine-free diet, severe neurological signs develop, leading to death. In other species, cataracts have been reported in dogs and feather abnormalities occur in chickens on deficient diets. a potent vasoconstrictor in mammals. the normal antidiuretic hormone in birds; released from the avian posterior pituitary. We first developed an assay to measure arginine metabolism in mouse plasma and serum, and subsequently transitioned the assay to human plasma for clinical studies. To determine whether arginine metabolism is altered in systemic inflammatory states, we measured arginine and metabolites in the plasma of mice with and without a peripheral injection of a proinflammatory stimulus (i. We then determined whether inflammation in humans was also associated with changes in arginine metabolism. Results of several studies have suggested that increased systemic inflammation is associated with impaired arginine metabolism (31-34). Endogenous synthesis of arginine would be increased to maintain the stability of the whole arginine metabolism under oxidative stress. In vivo whole body and organ arginine metabolism during endotoxemia (sepsis) is dependent on mouse strain and gender J.